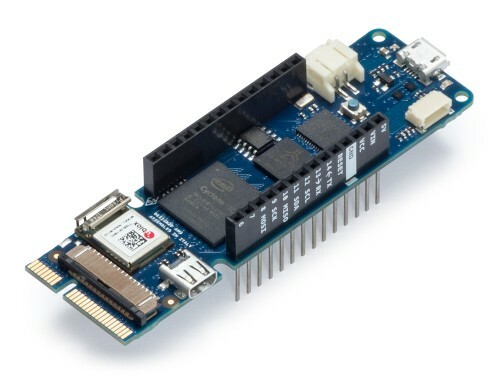 The Arduino MKR Vidor 4000 Arduino boards come with FPGA on board along with ARM cortex Zero processor, camera connector and Micro HDMI connector. A camera can be connected to the camera port for image or video processing like applications. Built-in HDMI connector helps in a visual display. The use of FPGA on boards can make audio and video processing extremely faster. It comes with 8 MB static RAM and 2 MB QSPI Flash memory with 1 MB for user applications. It also comes with built-in Wifi and Bluetooth powered by U-BLOX NINA W10 Series. The FPGA chip on board is Intel Cyclone 10 (10CL016), which contains 56 (18×18 bit) HW multipliers for high-speed digital signal processing and 504 KB of RAM with 16K Logic Elements. Each pin of onboard FPGA serves multiple functions and can toggle at speed of 150 MHz. The pins can be configured to be used as Sigma-Delta Digital to Analog Converter (DAC), Universal Synchronous Asynchronous Receiver and Transmitter (UART), SPI, PWM, I2C etc. However, there are some limitations in this board as well, it doesn’t have any Analog input/ output pins, No EEPROM, no any Interrupt pins. The DC current per IO is also very low and needs addition switching circuitry for connecting any device which requires more than 8 mA current.